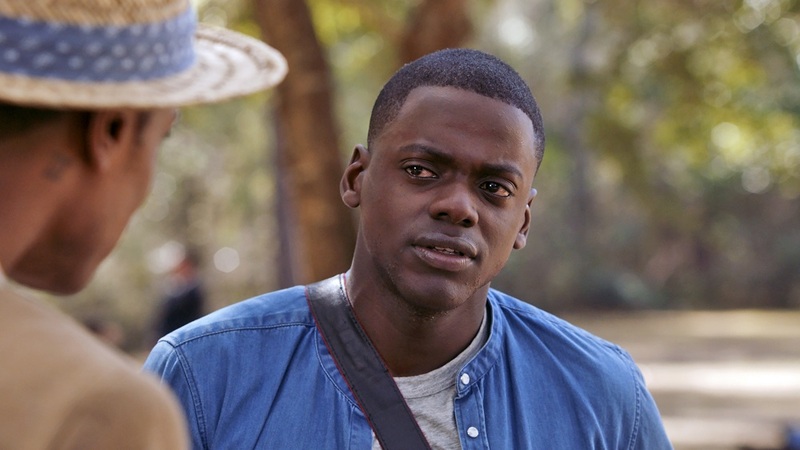 Photographer Chris Washington (Daniel Kaluuya) is apprehensive about meeting the parents of his Caucasian girlfriend Rose Armitage (Allison Williams). They don’t know he’s Black, and while both Dean (Bradley Whitford) and Missy (Catherine Keener) are by all accounts open-minded liberals who should be just fine with their daughter entering into an interracial relationship, that doesn’t mean it still won’t be a shock when he arrives arm-in-arm with her standing at their front door. Chris just doesn’t feel this is information that should be sprung on someone out of the blue, and as such he’s understandably on edge even as Rose lovingly urges him to try and relax. Unfortunately, it’s as weird and uncomfortable as he feared it would. Yes, Dean and Missy on the surface are decent hosts, but underneath the surface they and many other members of their small, affluent suburban community practice a form of unintentional racism that they don’t come close to recognizing. But, beyond that, there’s more going on, something positively horrific, and Chris is starting to get hints that he and Rose need to leave as soon as possible. There’s an underlying darkness to all this apparent kindness and sensitivity, a force so bleak and all-consuming it could literally transform someone into an entirely different person altogether. 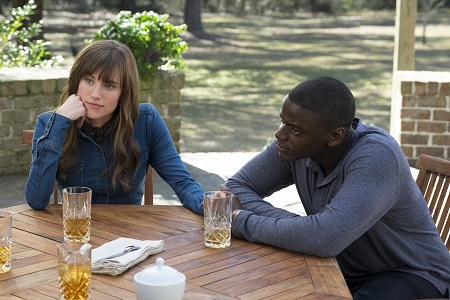 From the mind of sketch comedy impresario Jordan Peele (“Key and Peele”), the sinister, satirically unsettling horror-comedy Get Out features one of the best, most culturally savvy scripts of any film likely to be released in all of 2017. This movie goes for the jugular, offering up ideas and concepts that are particularly timely, the way it manages to look backwards and forwards with equal ferocity unquestionably startling. It’s a self-aware meta exercise in paranoia and understanding that analyzes race in ways few other pieces of Hollywood entertainment ever has, Peele utilizing the artifices and devices of the horror genre in ways bordering on genius. For those going in expecting an all-out scare-fest, be prepared as this is not that kind of motion picture. The horror elements, while solid, are admittedly also where Peele comes up a little bit short. Once we know what is going on, once the central conceit revolving around self-determination, corruption, subservience and psychological reconfiguration is revealed, there aren’t a lot of surprises or shocks. While the climactic rampage where Chris learns all and is forced to do what he can to make it through intact is nicely staged and acted, there’s also not much that happens that is unexpected, and as such the blood didn’t curdle near as much as I honestly would have liked it to. Thankfully, the horror aspects run secondary to the core plot threads, the hard-charging social commentary, the hysterical comedy and the insightful satire. Peele builds characters who are fascinating to deconstruct, each one working towards their own agenda, and while Chris is the fly trapped in a web he barely comprehends let alone realizes that it exists, it are the spiders crowding around him who serve up the proverbial banquet. They work in tandem, even if not always as a unit, their mutual desire for corruption, sacrifice, perversion and possession a sight to see. As such, the entire cast Peele has assembled to make all of this come to life is excellent across the board. Not just veteran pros Keener and Whitford (who, with this and Cabin in the Woods, seems to have a whole new career appearing in modern horror-comedies that aren’t quite what they appear to be on the surface), and not just core stars Kaluuya and Williams, but just about everyone else having any sort of speaking role whatsoever ad well. Stephen Root as a blind art gallery honor with a fondness for Chris’ pictures. Lakeith Stanfield as garden party attendee who’s robotic grin conceals an unimaginable inner turmoil. 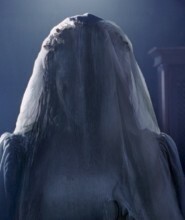 Marcus Henderson and especially Betty Gabriel as the Armitage family’s servants, both going through their respective duties with a ghostly precision that’s as creepy as it is intriguing. Best of all is Lil Rel Howery as Chris’ best friend and confidant Rod Williams, the wisecracking TSA agent putting two plus two together and becoming all but certain his good buddy has ended up somewhere he most definitely did not want to be. Can’t say I was as fond of Caleb Landry Jones as Rose’s menacing brother Jeremy, his performance so on-the-nose he might as well have a neon arrow pointed his direction proclaiming him as someone dangerous to keep an eye on. I’ll also admit, as sensational as practically all of the comedic beats prove to be, and as shockingly organic to the story at hand they astonishingly are, there is one extended gag involving Rod making a report to a bunch of incredulous police officers that feels like a skit pulled from “Key and Peele.” It stands out in a way that took me out of the movie, and as funny as the sequence is it is also the only one that just didn’t fit with any of the other bits that surrounded it. Peele directs with a confidence, however, he and cinematographer Toby Oliver (The Darkness) doing a marvelous job of manufacturing a visual ambiance that’s absolutely sensational. He also keeps the pacing sharp and focused for the majority of the film’s running time, crafting a sense of omnipresent dread that continuously sent shudders up and down my spine. 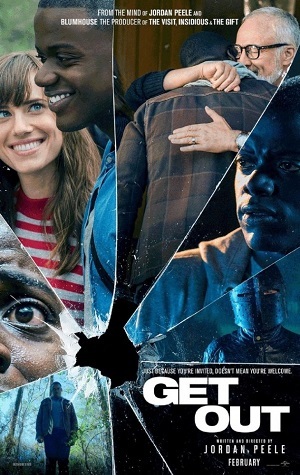 But it’s that script that still has me the most excited about Get Out, Peele’s ability to entertain and to edify, to produce laughter in the same instance that he slams his satirical points home with an unexpected sledgehammer, it’s all here and more. This film is a marvel of ingenuity and inspiration, a horror tale where the most frightening image is the mirror image of the audience realizing they’re the ones being so intimately examined.